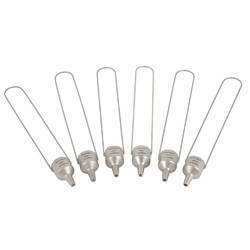 Offering you a complete choice of products which include elcometer 2354 bs viscosity flow cup, stainless steel density cup, frikmar viscosity dip cups, zahn dip viscosity cup, bs viscosity flow cups and afnor viscosity flow cups. BS Viscosity Flow CupsThe Elcometer 2354 BS Viscosity Flow Cups are very easy to use instruments made of anodized aluminium with a stainless steel orifice, for measuring the consistency of paints, varnishes and similar products.The measured kinematic viscosity is generally expressed in seconds(s) flow time. If the Standards stipulate conversion methods the flow time can be converted into Centistokes (cSt) using the Elcometer ElcoCalc™ Mobile Apps. Calibration certificates which offer traceability and assurance that each viscosity cup has been individually tested and comply to Standards are also available. The cups can be supplied separately or with an adjustable stand which includes a precision level and an overflow glass draw plate. They can also be supplied with a flow jacket for temperature control (thermojacket). 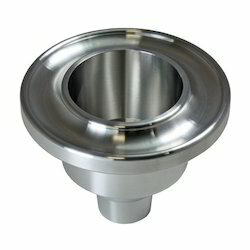 Viscosity Flow CupsViscosity Flow Cups are very easy to use instruments made of anodized aluminium with a stainless steel orifice, for measuring the consistency of paints, varnishes and similar products. The measured kinematic viscosity is generally expressed in seconds(s) flow time. If the Standards stipulate conversion methods the flow timecan be converted into Centistokes (cSt) using the Elcometer ElcoCalc™ Mobile App. Calibration certificates which offer traceability and assurance that each viscosity cup has been individually tested and comply to Standards are also available. The cups can be supplied separately or with an adjustable stand which includes a precision level and an overflow glass draw plate. They can also be supplied with a flow jacket for temperature control (thermojacket), see page 5 for more information. 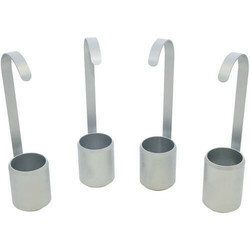 A stainless steel precision instrument for determining the specific weight of paints and similar products.This instrument consists of a cylindrical container and cover with a hole for exhaust of tested liquid excess.These can be supplied with or without a tare weight for weighing on a balance. Certificate of Calibration: issued for Fixed Calibration equipment and shows readings and traceability. Several ranges are available, according to the Standards being used, from 7 to 1100 cSt. available Certificate of Calibration: issued for Fixed Calibration equipment and shows readings and traceability. 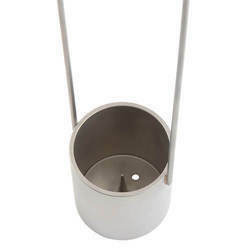 The Elcometer 2210 Zahn Dip Cup is a small U-shaped cup suspended from a looped wire. This method is ideal for measuring the consistency of paints, varnishes and similar products.Simply dip the cup into the product to be measured, lift it out and measure how long it takes for the contents to empty through the orifice. There are five cups with five different orifices sizes available, ranging from 5 to 1840cSt. Technical Specification:Part NumberDescriptionCup NumberOrifice DiameterRange (cSt)(i)K0002210M001Elcometer 2210/1 Zahn Dip Cup11.8mm5-56K0002210M002Elcometer 2210/2 Zahn Dip Cup22.7mm21-231K0002210M003Elcometer 2210/3 Zahn Dip Cup33.8mm146-848K0002210M004Elcometer 2210/4 Zahn Dip Cup44.3mm222-1110K0002210M005Elcometer 2210/5 Zahn Dip Cup55.3mm460-1840K0002210M001CElcometer 2210/1 with calibration certificate1 (e)1.8mm5-56K0002210M002CElcometer 2210/2 with calibration certificate2 (e)2.7mm21-231K0002210M003CElcometer 2210/3 with calibration certificate3 (e)3.8mm146-848K0002210M004CElcometer 2210/4 with calibration certificate4 (e)4.3mm222-1110K0002210M005CElcometer 2210/5 with calibration certificate5 (e)5.3mm460-1840Certificate availableCertificate of Calibration: issued for Fixed Calibration equipment and shows readings and traceability. Viscosity Flow cups are very easy to use instruments of anodized aluminium with a stainless steel orifice, for measuring the consistency of paints, varnishes and similar products. The measured kinematic viscosity is generally expressed in seconds(s) flow time. If the Standards stipulate conversion methods the flow time can be converted into Centistokes (cSt). 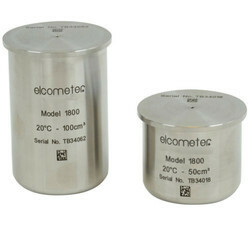 Elcometer offers the option to order viscosity cups complete with calibration certificates which offer traceability and assurance that the viscosity cups have been individually tested and comply to Standards. The cups can be supplied separately or with an adjustable stand which includes a precision level and an overflow glass draw plate. The stand can also be supplied with a flow jacket for temperature control (thermojacket). AvailableCertificate of Calibration: issued for Fixed Calibration equipment and shows readings and traceability. 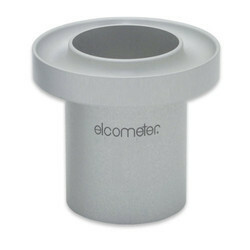 The Elcometer 2215 Lory Viscosity Cup is a conventional cylindrical cup with a needle fixed into the bottom for quick measurements on-site or during production. The cup is first dipped into the product to be measured, then empties through the escape hole. Unlike other Viscosity cups, the flow time is measured as soon as the point of the needle appears. 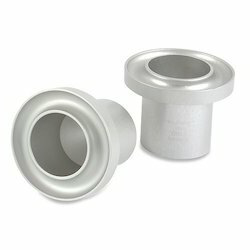 The Elcometer 2310 Shell Viscosity Dip Cups are stainless steel cups for quick measurements on-site or during production. These cups are often used in the printing or ink industry. Simply dip the cup into the product to be measured, lift it out and measure how long it takes for the contents to empty through the orifice. The measured kinematic viscosity is generally expressed in seconds (s) flow time, which can be converted into Centistokes (cSt). 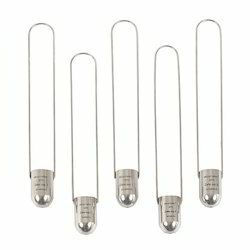 There are six different orifice sizes available, for measurements between 2 and 1300cSt. 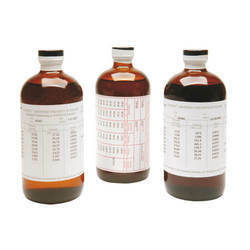 Specific calibration oils can only be used with specific flow and dip cups. Please use the table below to determine which calibration oil is required with each cup, or contact Elcometer. Viscosity oils are supplied in ½ litre (1 pint) bottles.